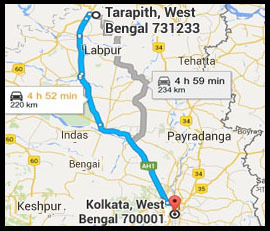 Tarapith (তারাপীঠ) is a small temple town near Rampurhat in Birbhum district of the Indian state of West Bengal, known for its Tantric temple and its adjoining cremation (Maha Smashan) grounds where sādhanā (tantric rituals)are performed. The Tantric Hindu temple is dedicated to the goddess Tara, a fearsome Tantric aspect of the Devi, the chief temples of Shaktism. 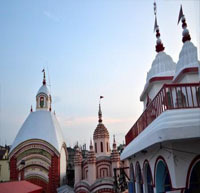 Tarapith derives its name from its association as the most important centre of Tara worship and her cult. Tarapith is also famous for Sadhak Bamakhepa, known as the avadhuta or "mad saint", who worshipped in the temple and resided in the cremation grounds as a mendicant and practised and perfected yoga and the tantric arts under the tutelage of another famous saint, the Kailashpathi Baba. Bamakhepa dedicated his entire life to the worship of Tara Maa. His ashram is also located close to the temple.